Factores restauradores que afectan la prognosis del tratamiento endodóntico. Sugerencia de un protocolo de trabajo. hecho de que los procedimientos restauradores afectan el éxito a largo plazo de la endodoncia. Odontología, Universidad Católica del Uruguay. Abramovitz I, Tagger M, Tamse A, Metzger Z. (2000). The Effect of Immediate Vs. Delayed Post Space Preparation on the Apical Seal of a Root Canal Filling: A Study in an Increased-Sensitivity Pressure-Driven System. J Endod;26:435-439. Abramovitz I, Lev R, Fuss Z, Metzger Z. (2001). The Unpredictability of Seal After Post Space Preparation: A Fluid Transport Study. J Endod;27(4): 292-295.
al-Hiyasat AS, Bashabsheh OM, Darmani H. (2002). Elements released from dental casting alloys and their cytotoxic effects. Int J Prosthodont.;15(5):473-8. Alves J, Walton R, Drake D. (1998). Coronal leakage: endotoxin penetration from bacterial communities through obturated post-prepared root canals. J Endod;24(9):587-91. Angmar-Mansson B, Omnell KA, Rudd J. (1969). Root fractures due to corrosion. I) Metallurgical aspects. Odontol Rev;20:245-265.
tissues. Scand J. Dent Res;86:200-205.
obturation and post space preparation. Oral Surg, Oral Med, Oral Pathol, Oral Radiol Endod;84:310-314. Bourgeois RS, Lemon RR. (1981). Dowel space preparation and apical leakage. J Endod.;7(2):66-69. Burch JG, Hulen S. (1974). A study of the presence of accessory foramina and the topography of molar furcations. Oral Surg Oral Med Oral Patho;38(3):451-455.
in endodontic therapy. Scand J Dent Res;89:321-328.
location, and size of accessory foramina in primary and permanent molars. Quintessence Int.;Oct;35(9):699-705. Derand T. (1971). Corrosion of screw posts. Odont Revy;22:371-378.
threaded posts. J Prosthet Dent;53:323-325.
during insertion of prefabricated posts related to root size. J Prosthet Dent;53:786-789. Deveaux E, Hildelbert P, Neut C, Romond C. (1999). Bacterial leakage of Cavit, IRM, TERM, and Fermit: a 21-day in vitro study. J Endod;25:653-59.
solvent techniques and Peeso reamers. J Endod;8(8):351-354.
condicoes artificiais indutoras de corrosao na presenca o ausencia de tensao. Re. Odontol Unicid;5:91-104. Eriksson JH, Sundstrom F. (1984). Temperature rise during root canal preparation-a possible cause of damage to tooth and periodontal tissue. Swedish Dental J;8:217-23. Fan B, Wu MK, Wesselink PR. (1999). Coronal leakage along apical root fillings after immediate and delayed post space preparation. Endod Dent Traumatol;15:124-126. Mariette 1746. Paris J. Prelat 1961. Fovet Y, Pourreyron L, Gal JY. (2000). Corrosion by galvanic coupling between carbon fiber posts and different alloys. Dent Mater;16(5):364-73.
post and core technique. Int Endod J;30(6):361-368. Gish SP, Drake DR, Walton RE, Wilcox L. (1994). Coronal leakage: bacterial penetration through obturated canals following post preparation. JADA;125:1369-1372. Glanz & Nilner (1986). Root canal posts, some prosthodontic aspects. Endod DentTraumatol;2:231-33. Goldsmith et al. (2002). The effect of sodium hypochlorite irrigant concentration on tooth surface strain. J Endod;28(8):575-79.
calcium hydroxide on its flexural strenght and elastic modulus. Int Endod J;34:113-119. Hommez GMG, Coppens CRM, De Moor RJG. (2002). Periapical health related to the quality of coronal restorations and root fillings. Int Endod J;35:680-689.
coronal restoration quality on the composition of the root canal microflora in teeth with apical periodontitis by means of T-RFLP analysis. Int Endod J;37:819-827.
lenght on the apical seal. Egypt Dent J;41(4):1457-62.
on apical dye leakage using two different sealers. J Endod;22:583-585. Kvist T, Rydin E, Reit C. (1989). The relative frecuency of periapical lesions in teeth with root canal-retained posts. Chlorhexidine used as a root canal irrigating solution. J Endod;25(3):167-171.
human teeth. Odont Revy; 29:367-381. Lucas LC, Lemons JE, O’Neal J, Joshi U. (1988). In vitro and in vivo corrosion analysis of copper alloys (abstract). Lucas LC, Lemons JE. (1992). Biodegradation of Restorative Metallic Systems. Adv Dent Res;6:32-37. Luu KQ, Walker RT. (1993). Corrosión de un poste de metal no precioso: presentación de un caso. Quintessence (ed.esp.);6(9):582-585. Marshall FJ, Massler M, Dute HL. (1960). Effects of endodontic treatments on permeability of root dentine. OS, OM & OP;23:208-222. Mauttoni H, Parodi G, Mauttoni D. (1994). Pernos radiculares colados y de stock: estudio comparativo. Odontol Urug;42(1):4-12. Meister F, Lommel TJ, Gerstein H. (1980). Diagnosis and posible causes of vertical root fractures. Oral Surg;49:243-53. Fillings After Immediate Post Space Preparation and Coronal Leakage. J Endod; 26(12): 724-728. Obermayr G, Walton RE, Leary JM, Krell KV. (1991). Vertical root fracture and relative deformation during obturation and post cementation. J Prosthet Dent;66:181-87. Parodi G. (1995). Comportamiento de la dentina del diente despulpado. Factores biológicos y mecánicos. Odontol Urug;43(1):14-20. Parodi G, Corts JP. (2004). Pernos radiculares estéticos. Evolución y aplicaciones. Actas Odontológicas;1:34-51. Parodi G. (2009). Cementado adhesivo de los pernos de fibra... ¿desafiando los límites? En Anales del 2do. Congreso Internacional de la Sociedad Uruguaya de Operatoria Dental y Biomateriales. Montevideo: Mastergraf. Págs 40-42. Posti JJ. (1983). The permeability of root canal walls prepared for post anchorage in permanent incisors, canines and premolars. Proceedings of the Finish Dental Society; 79 (Suppl 1). Pucci FM, Reig R. (1945). Conductos radiculares: anatomía, patología y terapia. Montevideo: Barreiro& Ramos. 2 vol. Ray HA, Trope M. (1995). Periapical status of endodontically-treated teeth in relation to the technical quality of the root filling and the coronal restoration. Int Endod J;28:12-18. Oral Med Oral Pathol Oral Radiol Endod:90:354-59.
restoration and fracture or caries. A histobacteriological study of reated cases. Int Endod J;36:787-802. Saunders EM, Saunders WP. (1989). The heat generated on the external root surface during post space preparation. Int Endod J;22:169-173.
treated multirooted teeth. Int Endodont J;23:28-33. Siqueira JF, Lopes HP, de Uzeda M. (1998). Recontamination of coronally unsealed root canals medicated with camphorated Paramonochlorophenol or Calcium Hydroxide pastes after saliva challenge. JEndod;24(1):11-14.
alloys (abstract). J Dent Res 69:264. Stoffers K, Strawn S, Asgar K. (1987). Evaluation of properties of MS dental casting alloy (abstract). J Dent Res; 66:205.
periapical health of endodontically treated teeth. Endod Dent Traumatol; 16(5):218-21. Trope, Chow, Nissan. (1995). In vitro endotoxin penetration of coronally unsealed endodontically treated teeth. Endod Dent Traumatol;11(2):90-4. Vallittu PK. (1998). Compositional and Weave Pattern Analyses of Glass Fibers in Dental Polymer Fiber Composites. Journal of Prosthodontics; 7(3):170-176.
furcation and pulp chamber of molar teeth. Oral Surg Oral Med Oral Pathol;62:319-326.
casting alloys. Int J Prosthodont;8:9-14. Williams DF. (1981). Biocompatibility of clinical implant materials. Vol.1. Boca Raton (FL): CRC Press. Wu, Pehlivan, Kontakiotis, Wesselink. (1998). Microleakage along apical root fillings and cemented posts.. J Prosthet Dent;79: 264-69. Zmener O. (1980). Effect of dowel preparation on the apical seal of endodontically treated teeth. J Endod; 6(8):687-690. PARODI ESTELLANO, Gustavo. Factores restauradores que afectan la prognosis del tratamiento endodóntico. Sugerencia de un protocolo de trabajo.. Actas Odontológicas (Publicación discontinuada), [S.l. ], v. 6, n. 1, p. 12-26, apr. 2016. ISSN 2393-6304. 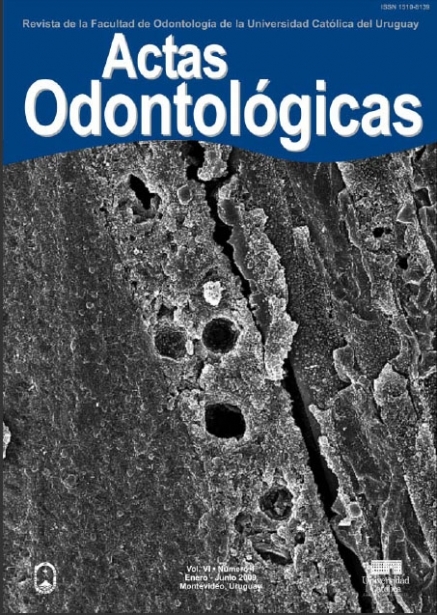 Disponible en: <http://revistas.ucu.edu.uy/index.php/actasodontologicas/article/view/1085>. Fecha de acceso: 24 apr. 2019 doi: https://doi.org/10.22235/ao.v6i1.1085.